← “Life’s too short to carry an ugly pen!”™ So why not carry a Tornado? 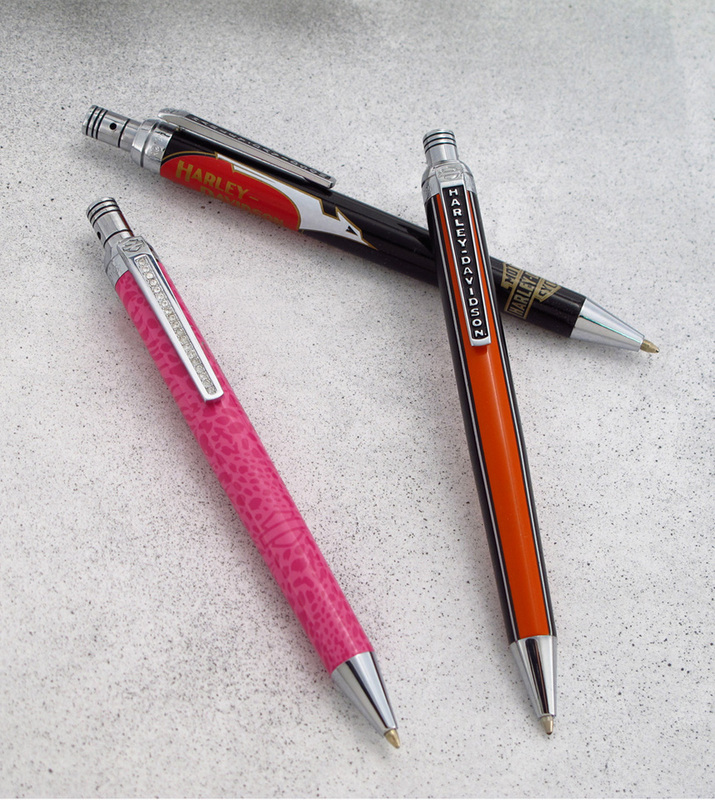 The Retro 51 Harley-Davidson® Series Adds New Pens & An All-New Collection! Summer just got even hotter with the newest additions to the Retro 51 Harley-Davidson® Series! Introduced at the Harley Davidson® Summer Dealer Show, our latest pens and all-new Blackline Series offer stylish designs and styles for every Harley enthusiast and pen lover. Each Stroker features a piston-inspired click-top, and is loaded with an easy-flow ballpoint refill. This series includes the Classic Stripe, and the recently added Ivory Eagle and Pink Exotic. The Ivory Eagle incorporates vintage graphics from the 1940s Harley-Davidson®, while the Pink Exotic features 19 Swarovski Crystal gems in its clip. It was also selected as the number one pen in our collection among dealers, and is of course, a favorite of the ladies. Named after the Harley engine used between 1929 and 1974, Flatheads are uniquely designed flat-topped pens that feature a compact, rectangular body shape, and an extra-large clip that provides strong gripping power. 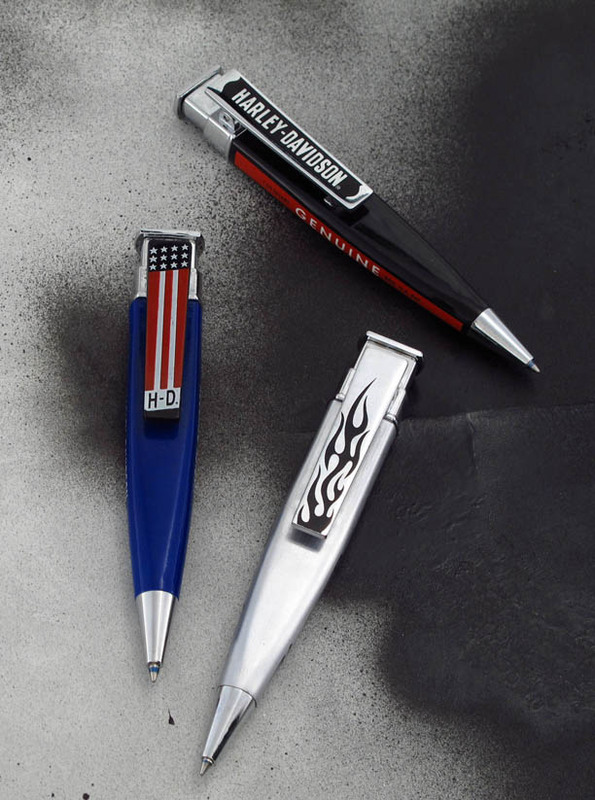 Available in three graphic styles: Black Oil Can, the Harley-Davidson® Flag, and Silver/Black Flame, Flatheads are the ideal pen for those who enjoy the convenience of clipping their favorite pens to areas such as the button edge of their shirts, or on a belt loop. The rugged design and antique accents of the Blackline make it a definite attention-grabber. The newest in our Harley-Davidson® series, this magnetically capped ballpoint comes loaded with an easy-flow refill and dons a sculptural metal mid-ring design. The Blackline is available in two designs: the Harley-Davidson® Logo with brushed charcoal and the Harley-Davidson® Skull in matte black with orange pin striping. Please visit our website, for more information on the entire Retro 51 Harley-Davidson® Series and to find a Retro 51 dealer near you. Which of the new Harley-Davidson pens is your favorite? Let us know. We’d love to hear from you!